It’s not enough to have CO and smoke detectors professionally hardwired into your home’s electrical system. We strongly recommend you test the batteries for the units every six months. It’s a good idea to make this testing part of the maintenance you have done for your HVAC system in the spring and fall. This makes it easier to remember. “But my detectors are wired into the home’s electrical system. Why worry about batteries?” This is a comment we hear a lot. Freestanding units obviously must operate from batteries, so it seems strange to worry about batteries if the detectors are connected directly into a power supply. However, these hardwired detectors also have batteries in them as backups. Power losses to homes have become more frequent over the last decade, especially during periods of storms and extreme cold. (This last winter was an excellent example.) You don’t want your detectors to shut off in cases of a power outage—you need them then more than ever! Press the “test” button on each detector, and if you get a long beep in response, the batteries are still in good shape. Change the batteries if you don’t get a response. 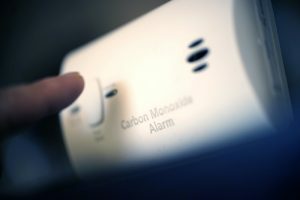 If you begin to hear a detector in your house emit a sharp beep every few minutes (or more frequently), this is the unit warning you its battery needs to be replaced. Don’t let the beeping go on or try to silence it by dismantling the detector! That warning beep exists for a good reason: you always want backup systems working. Our electricians are dedicated to more than keeping your electrical systems working in peak condition. They’re also dedicated to keeping the electrical systems working safely and steadily, when you need them. This is why we install and service whole-house generators, and it’s why we provide installation and replacement work for smoke and CO detectors. If you still have detectors that run strictly off battery power, schedule service with our electricians to put in new ones. They know the best locations to provide the protection you want for your family. ServiceMax is open 24/7—All Day, Every Day! Arrange for home electrical services in Chicagoland with our licensed and experienced electricians.